Well, we put Zach Stewart on the mound again, and he disappointed again. We lost. Our runs were the result of only two scoring plays in the whole game. We did not play well at all. It started and basically ended with Stewart. He gave up five runs on seven hits over the course of only two and two-thirds innings. He walked none and struck out one. His fourth pitch of the game was hit for a solo shot, and then he loaded the bases by giving up two singles and hitting a batter. One run scored on a double play, and the other scored on a single. He’s lucky he escaped with only those three runs. He went one-two-three in the second but was back at it in the third; his sixth pitch of the inning was hit for a solo shot, he got the inning’s first out, he gave up a single, he got the inning’s second out, and then he gave up an RBI single. And that was when he was replaced by Mortensen. Mortensen finished the third, fourth, fifth, and sixth. He gave up a solo shot to lead off the fifth, which was Baltimore’s last run of the game and Mortensen’s only blemish. Carpenter pitched the seventh, and Padilla pitched the eighth. We didn’t score until the fourth, and when we did, we were already behind by five. Ross led off the fourth by smacking a seventy-eight mile-per-hour changeup out to left field for a solo shot on the second pitch of the frame. That was it until the seventh, when Lavarnway singled and Nava hit a home run of his own to left field, this one for two runs and on Nava’s first pitch, an eighty-eight mile-per-hour fastball. Both home runs were expertly hit, both consisted of healthy swings, and both were great to watch except for the fact that, like I said, they were our only scoring plays. If they had been part of a larger slugfest or something, they probably would have looked a lot better. With this 6-3 loss, we are now down to our last series of the season. It’s against New York, and we should at least put up a strong showing to make it hard for them or something. Anyway, while the Orioles were celebrating their first playoff berth since 1997, we were just swept right out of Baltimore and have lost ninety games in a season for the first time since 1966. In other news, the Pats downed the Bills by the healthy score of 52-28. We lost again. We shouldn’t have, but we did. You could say that about most of our losses this year, but this time it’s especially true. It’s not so much that the hitters pulled more than their own weight than it is that the relievers should have been able to work with what they had but didn’t. Neither team scored through five, and we got on the board first. Iglesias singled on the first pitch of the sixth, Ellsbury struck out, Pedroia flew out, Ieglesias moved to second on a wild pitch and scored on a double by Ross, who scored on a single by Lavarnway with help from a deflection. Neither team scored in the seventh, and we added a run in the eighth; Lavarnway doubled and scored on a triple by Gomez. We scored our last run in the ninth on a solo shot by Iglesias. It was the first home run of his Major League career. The count was 0-2 and he got an eighty-eight mile-per-hour sinker as his fourth pitch, and he just completely unleashed. He clobbered the ball beyond the left field fence. Meanwhile, Buchholz pitched yet another gem. The Rays didn’t score their first run until the eighth. That was after Buchholz left. 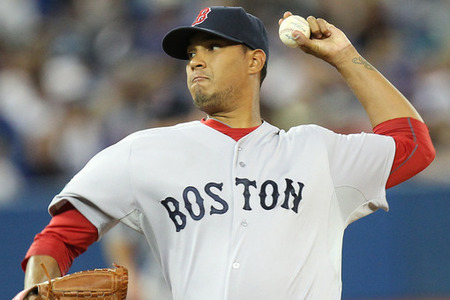 Buchholz pitched seven shutout innings; he was as solid as he’s ever been. He induced three straight groundouts in the first, pitched around runners on second and third in the second and a runner on second in the third, induced a groundout and two popouts in the fourth, pitched around runners at the corners in the fifth, induced two groundouts and a strikeout in the sixth, and pitched around a runner on third in the seventh. And in fairness to him, both doubles he allowed were the result of the fact that Ciriaco was starting in center for the first time ever and had his fair share of trouble. Tazawa came on in the eighth. He gave up a double that eventually turned into a run on a sac fly. If that had been all, it would have been fine because, at the time, that run shrunk our lead to tow, but at least we still had a lead to speak of. Bailey came on in the ninth, and that was when we lots the game. Think about that. We played an entire game’s worth of baseball, and it meant nothing because of the last inning alone. Granted, the offense didn’t do much for most of it, but the fact is that we were in line to win in the end. We were in line to win right up until the ninth inning started. We were even in line to win three batters into the ninth inning. Even five batters into it, we were winning by less, but we were still winning. But when the teams walked off the field, we had lost. Bailey had taken over. He gave up two consecutive singles, and both runners advanced on a groundout. He gave up a third single that scored the Rays’ first run of the inning. Thanks to a steal and a walk, Bailey had runners on first and second again, and he gave up another single that scored the second and third runs of the inning. Technically, all that did was tie the game. So it was still conceivable that we could have won given the opportunity to play extras. But we never got the chance. Padilla came on and gave up a three-run home run and that was that. It was the fourth pitch of his only at-bat. All four pitches were four-seam fastballs. All four pitchers were almost exactly the same speed. But it was the last one that did us in. So we lost, 7-4, and it was all the bullpen’s fault. They did exactly what they were not supposed to do: lose the game. Relievers are called relievers for a reason. They’re supposed to provide relief. That means that they’re supposed to walk in and leave the opponent’s scoreboard exactly the way they found it. And that’s not what happened last night. Not even remotely. The Rays scored six runs in the ninth inning. It doesn’t matter that we only scored four; apparently four runs was good enough for Buchholz. A reliever is supposed to take what he can get and work with it. 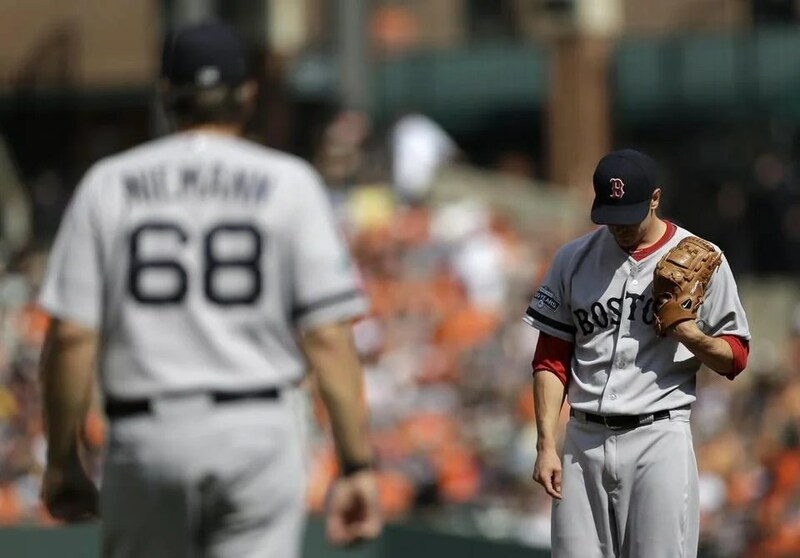 Tazawa got a hold, and Baily got an incredibly well-deserved blown save as well as a fitting and appropriate loss. And that’s why it hurts. The relievers didn’t provide relief. They provided loss. That’s what I’m talking about! Even if we are eliminated from the playoffs, we may as well go out with a bang, with our heads held high, and with our dignity still intact. And keeping the Rays out of it would be a fantastic bonus. Doubront gave up three runs on one hit while walking five and striking out five over six innings. He didn’t give up any home runs, so it was the walks that caught up with him. His first two innings were fine. But after opening the third with a strikeout, he issued three consecutive walks to load the bases and eventually cleared them thanks to a single and a sac fly. After that he went right back to cruising. Doubront put us in a hole three runs deep but left the game with a lead. Ross doubled to open the forth and scored on a single by Loney. We tied it up in the fifth; Iglesias singled, Ciriaco walked, and Ellsbury singled and Pedroia hit a sac fly that scored each of them, respectively. Salty opened the sixth by striking out, but Lavarnway and Podsednik hit back-to-back singles. Iglesias grounded out, and then Ciriaco reached on a throwing error induced by his speed (rushing to the point of error is obviously never a good thing), Lavarnway scored, and Podsednik was out at the plate. 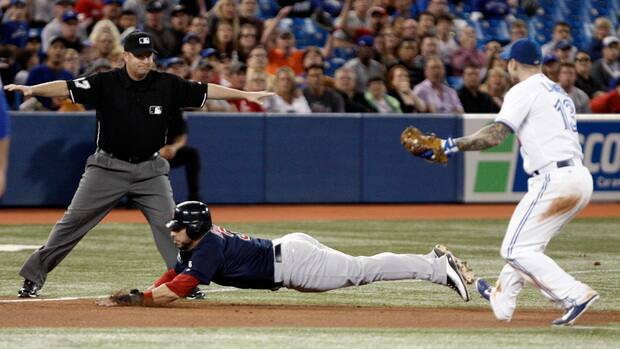 And with two out in the seventh, Ross and Loney worked back-to-back walks, Salty singled in Ross, and Lavarnway doubled in both Loney and Salty. Mortensen came on in the seventh and loaded the bases after securing the first two outs by hitting a batter and walking two. Then Tazawa came on and allowed a single that scored two. Those were the last runs that either team would score. Padilla and Breslow pitched the eighth, Bailey pitched the ninth, and we won, 7-5. And the Rays look more and more like they won’t be tasting postseason glory.